Everett Golson must have been caught cheating in exams or something of that magnitude to have drawn the punishment he did at Notre Dame. The college would have suspended him as a last resort given the importance of his presence to the team and the high hopes placed in him for 2014 bowl glory. It must have been a very serious matter to warrant suspension at a critical time for the football program. There had been some rumors about wayward behavior by Golson including showing up late for practise last year but nothing too serious which makes the announcement even more of a stunner. Brian Kelly must think he is snakebitten at the position. His obvious up and comer and Golson replacement Gunner Kiel just decamped elsewhere to Cincinnati. Tommy Rees is a reliable back up and spot player but does not possess the tools for the wide open Kelly offense. As for Golson, despite his pledge to be back it is a long way to Fall 2014. His statement seemed very defensive, "My parents and the community I grew up in have instilled values in me that have and will continue to allow me to be successful in the future," he said. "There have been many lessons learned as I worked to become the starting quarterback at Notre Dame and each was a result of coach [Brian] Kelly's belief in me as an athlete and a person. "At this point, I understand how my integrity could be in question but I want to reassure my supporters that through this experience I will return a better student athlete as well as a better individual. "Lastly, I want to thank the University of Notre Dame for the opportunity already granted and also the opportunity going forth to regain my eligibility in the winter of 2014." Former Oklahoma State quarterback Wes Lunt has drawn interest from Notre Dame within the past month and now may again be an option, a source told ESPN's Joe Schad. Lunt will visit Louisville on Tuesday, a source said. Lunt would not be eligible this season. He is also considering Illinois. Former Fighting Irish quarterback Gunner Kiel transferred to Cincinnati last month. He said Sunday he is committed to coach Tommy Tuberville and the Bearcats in response to speculation he could try to return to Notre Dame. Senior Tommy Rees is the most experienced quarterback enrolled, with 18 career starts. Fourth-year junior Andrew Hendrix and Malik Zaire, a spring enrollee, are also on the depth chart. Zaire was the sixth-ranked QB prospect in the Class of 2013, according to the ESPN 300. 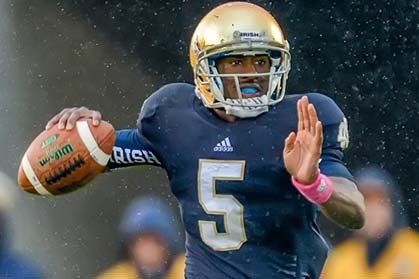 There could be precedent for a chance for Golson to reapply to Notre Dame.